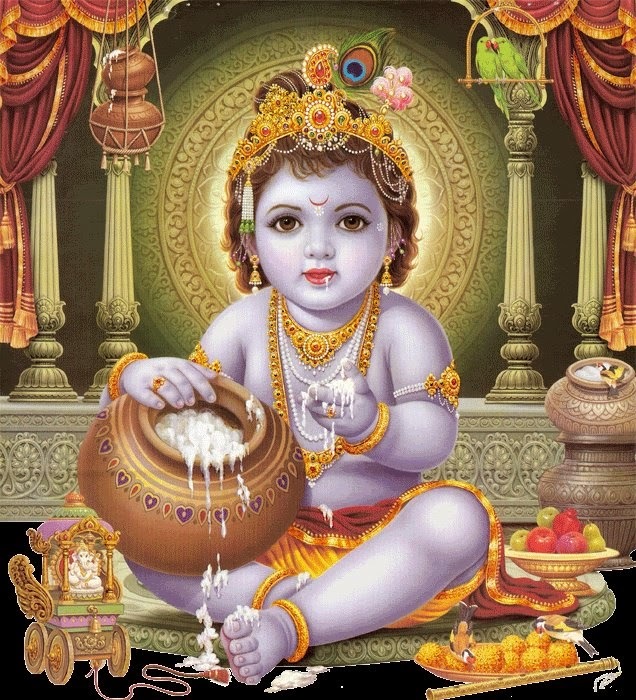 Janmashtami / Krishna Jayanthi /Gokulasthami is the celebration of Lord Krishna's birth. It is a festival celebrated throughout India. Major celebrations of Janmashtami takes place at midnight as Lord Krishna is said to born at midnight.On this auspicious occasion, temples and homes are beautifully decorated and people visit temples till late mid night . Janmashtami is celebrated differently in different parts of india. e.g.Janmashtami or Gokulashtami, popularly known in Mumbai and Pune as Dahi Handi, is celebrated as an event which involves making a human pyramid and breaking an earthen pot (handi) filled with buttermilk (dahi), which is tied at a convenient height.Whereas in north india, devotees place images of krishna’s infancy in swings and cradles in temples and homes. In north India people celebrate Janmashtami by fasting and staying up until midnight. Devotees observe strict fasting during the festival. While some keep nirjal or waterless fasts, others eat fruits. With the changing times,some people no longer observe stringent fasts, they eat curd, certain other vegetables etc during the day. We use rock salt or sendha namak instead of normal salt. during fasting.All the rules which applies for navratri fasting applies for the recipes which you can have for janmashtami fasting. Here are some recipes that are suitable for Janmashtami Fasting and which you can prepare easily during the occasion.